This time of year, all the color seems to have drained from the world. No flowers yet, no butterflies. Even the birds are hiding till the warm weather comes. 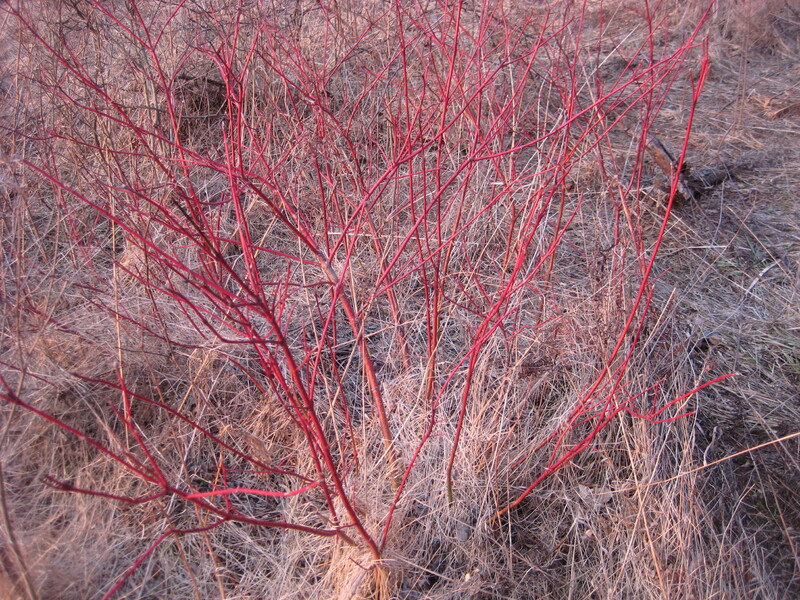 In the early spring drabness, this shrub stands out like flame against the dried brown grasses. 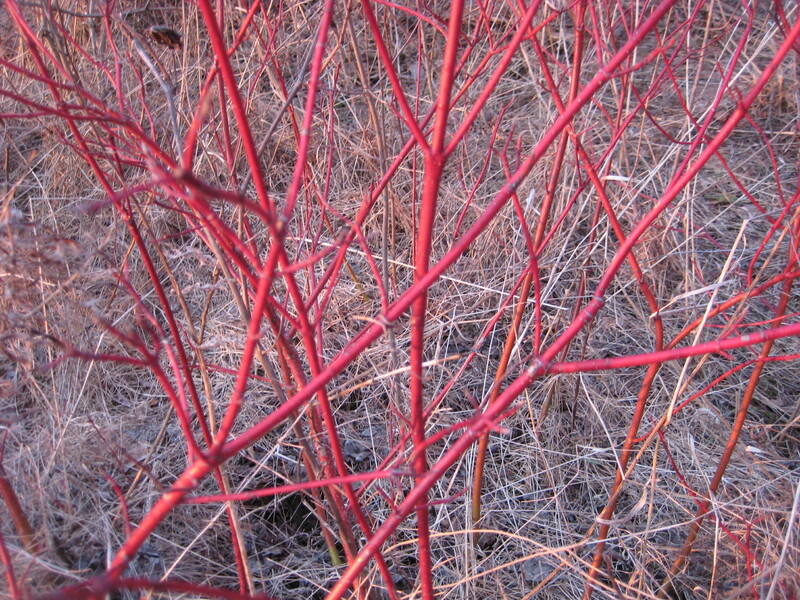 Red Osier Dogwood–one of many species of dogwoods, with juicy berries much beloved by fall birds. The berries are long gone, but the twigs still glow like embers. It’s a native plant, a cold-weather-lover. It grows all over the US, but can even tough it out way up north in Alaska and the Yukon, where it does its best to warm the cold days with cheerful color. 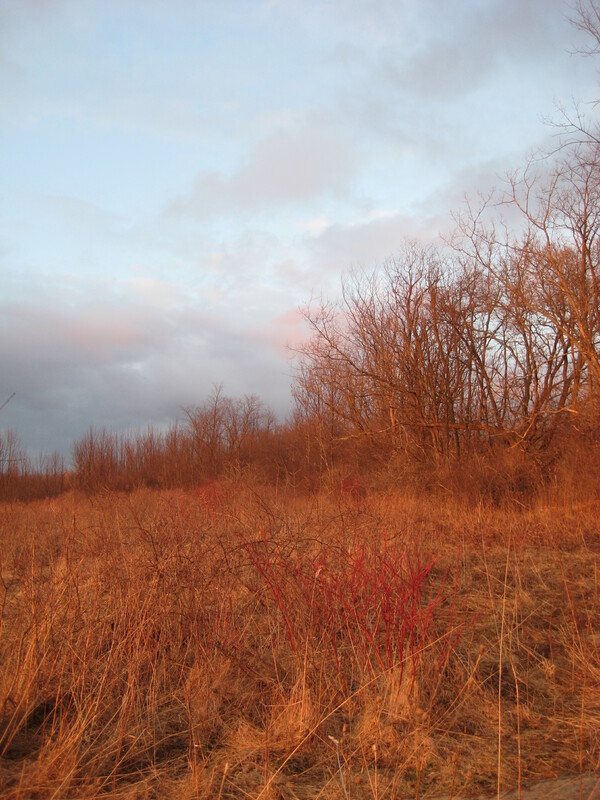 Native Americans used this plant in many ways, for food and medicine–the berries grow thick on the red twigs in fall, and have a lot of nutrition, although they don’t taste very sweet. But mostly this plant was beloved of basket weavers. The supple willow-like twigs add a stripe of color to traditional basket designs. I’ve never actually woven a basket myself–it’s a craft I’ve always meant to try. But there aren’t enough of these scarlet bushes that I feel justified in stealing any branches. I’ll leave them in the meadow, to warm up these frigid April days. I have these growing all over my parents farm and this year and last year I took a 4-5 foot high branch-system and put it in water. When you do this, they develop these amazing bright green leaves within a week. So you have this wonderful almost hot pink/cranberry tree with almost lime green leaves on it. I am addicted to doing it and will try to plant them in soil to see if they will grow indoors. They really love the mushy creek-bed and wet fields after the snow melts. How interesting! I’ll have to try that–it sounds beautiful.